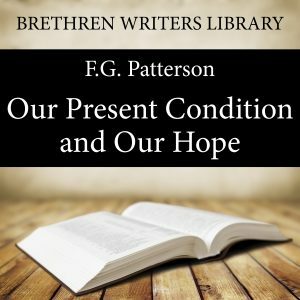 Our Present Condition and our Hope by F.G. Patterson shows the believer as to the past, a suffering, dead and risen Christ; as to the present, the association of the people of God with Him in a pathway of suffering and rejection; and as to the future, His coming again in glory, and taking to Him His great power to reign, and our association with Him in His glory. Our HOPE: The Lord will come again in power and great glory - the great event which will bring about all this glory for which He waits and we wait. It is near, beloved brethren; the heart feels conscious that it is so; and the present action of the Holy Spirit marks it as very close at hand. By examining the two letters to the Thessalonians, F.G Patterson reminds us of what we have to look forward to. He also shows us that the ‘Coming’ and the ‘Appearing’ are two entirely different things, as are the ‘Great White Throne’ and the ‘Judgement Seat of Christ’.